We spent a little more this week on groceries. I know that is fairly good though for some people, but I do not usually spend quite that much, but I found some good deals this week on some things that we can use in the coming weeks. You can see my menu on one of the previous posts for the week and see that we have several extra things. I made a large pot of sauce last night over 2 gallons of spaghetti sauce which will last for several meals. I splurged on a couple of extra things as well. <p> Well, it feels weird to be this transparent…..It is not a very healthy week too as you can see! I think though I have 6 lbs of popcorn which is way too much, maybe the grinding thing will work out though! 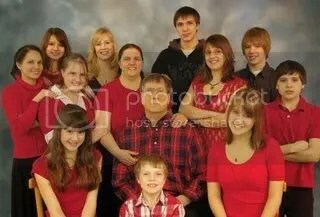 <p> I am the oldest of 11 and although most of us live in the area it is really hard to get us all in one place and ready for a picture. Mom really wanted this though as she figured it may be the last year! This is all of us, we actually went to a studio where the lady was very kind and cheap! She put up with all the loud ones who have lots of opinions and silliness mostly. My dad was sick too and we had to make sure he did not faint on us! That is my youngest brother in the very front, he is 8 years old and younger than both a nephew and niece! <p> Last week went well, they had borcht for lunch all week with PB sandwiches. We only used 2 gallons of milk last week as I ended up not being able to get any until Friday also! We usually use 4 gallons. <p> I am going to attempt making my own cornmeal this week from popcorn, to see if it a cheaper and I heard it tastes better. Then it is whole grain also, not the germinated stuff from the store. I had bought 10 lbs of carrots and we are partway through the bag, they were only $3.99 at Costco. <p> You should check out my mom’s blog at her green smoothies from spinach she has been making. She says they taste good and if my brothers are drinking them, they must be! as they deal with the loss of their father and husband. Anyhow, we are in the process of applying for a loan for a house, it is a long drawn out affair and we may find out if we are approved this Tuesday. I am not sure what exactly we are doing, if this is a good thing or not, but I am praying God’s will will be done. We have a steady income right now so it is a good time and it would actually reduce our cost of living a bit, so we could maybe save a bit! also, housing costs are down right now, so it is a good time to buy. I managed to get the living room in living condition, it has not been since Thanksgiving, so that was a relief! Tomorrow, I have the boys room to hit as we are missing some things that have to be found tomorrow! <p> Also, our washer needs repair. It is leaking and to find out what is wrong, the repair guy costs alot and it could be something simple or it could be a $300 repair which I would almost rather buy a new washer. This one is only 6 years old though so that seems weird that it would be that bad. Anyhow, I am going to reduce clothing, not get rid of, but pack away so since we have to go to the laundry mat we only have a small amount of clothes. It is a little overwhelming to me, but I used to only do laundry every week -2 weeks and have like 5 loads. But we only had 1-2 children and they were small! I don’t know if cereal counts as a frugal food as milk is not that cheap, but lately I have gotten cereal so much from .50-.80 a box for good cereal. Yesterday I got 8 boxes of 17 oz. Oatmeal Crisp General Mills cereal for .80 a box!! It was on sale for 8 boxes for $18, then if you bought 8 boxes you got $8 off of the cereal. I had two coupons for $3.50 off 8 boxes of cereal that had printed from buying cereal before, but often they have cereal coupons in the aisle. We are way stocked up on cereal! Since it is winter and cold, I have them on a shelf in the shed to store them! One had almonds in it and the other kind had raisins! Yum! <p> I also went o Bath and Body Works, I think the sale may end today or tomorrow, but they had lots of things 75% off of nice lotion, $4-5 for all their signature lotions and body wash, $2 for some kinds as well as some wonderful minty lip balm, a large tube! I had a gift card there so was able to buy some, but some of the tiny bottles were only .75-1.00 and some was .65!!! <p> JC Penny had coats, gloves, shirts, all cheap! We got pajamas for $2.79, very nice pajamas that delight every little boys heart! I bought a sweater for myself for $2.79. Most of the stores have great clearance sales right now, so check your out! I got a $20 gift card for my birthday from my sister to Bath and Body Works and have been putting off going to the store, but today took the time to go! Boy, was I glad I did! They had all kinds of stuff on sale and I got a whole bunch of my favorite Mint Julep lotion for only $1 for small bottle, I got 7 as I think they are not going to sell it anymore! I got a bunch of other stuff, I think 2 big bottles of lotion, the Mint stuff, another 24/7 lotion, a bottle of special body wash, lip balm that has mint in it (I have really liked the way it feels lately!) and some other stuff! On a normal time, I could have only bought 2 bottles and that was it! It was cheaper than Walmart! Anyhow, it was fun to go shopping for it! Yesterday it was snowing quite a bit! It was these big flakes that were really coming down, so it sort of felt like a lazy day and took me a bit to get going. We had planned to go ice skating at 4 pm, so I sorted stuff and got out the boys stuff so they could go, our ice skates and drove over in the snow to the rink! We had alot of fun! We skated about an hour and there was about 2 in. of snow on the ice in the hour we were skating. They had cleared it right as we got on, so that was alot of snow! After about an hour and half though, my ankles were killing me and today, I sure feel I worked the muscles in my ankles! Wow! The boys loved it, and took to it like they have been skating all their life. They sure are Russian! <p> After a brief rest period I got started on my cooking for Sat night dinner and Sunday’s food. I do not like to cook on Sunday, so if I make food on Saturday then i don’t have to. Tomorrow, the two younger boys are going to visit a friend and hopefully it goes well and we may do it on a regular basis. It took me a long time to get the van all ready to drive this morning as the snow was pretty deep on the ground and the wind had blown and frozen ice all over it. I scraped and scraped and yet still drove very slowly to church as I could not see out the best, but enough! I guess that is why garages are nice! The doors were frozen shut and the sliding one did not want to open very well until it had warmed up. I am loving this weather! It has been such a long time since we had a real winter and I am so glad this one turned out to be real. <p> Shopping: Never buy anything full price, clothes, food, etc. Eventually almost everything goes on sale or clearance and if it doesn’t, I usually decide I didn’t need it that bad! Right now, JC Penny has most winter stuff 70-80% off, later they mark things so low, you cannot beat it, even in the thrift store. My husband saw a really nice winter coat there yesterday for $7, where at the local Salvation Army they were charging what a coat would cost new….something was wrong with that! Check online sales as well! <p> Anyhow, that is just some ways we are frugal!